Update: Check out https://www.epicgardening.com/how-to-remove-rust-from-tools/ for more on this topic! Using old tools in the workshop is an amazing experience. When tools are properly restored, they are often just as good if not better than many products made today, and the history that accompanies them is so inspiring. I love using old tools previously owned by a maker whose skill level I will likely never reach. I imagine their lives, their hands, the pieces they built. Using antique tools to build furniture that breaks the Ikea mold, furniture that will last not only my whole life, but will likely outlive my grandchildren as well is a really incredible feeling. Antique tools can often be acquired and restored fairly cheaply, but depending on the condition in which the tool was found, the restoration process can take a long time. 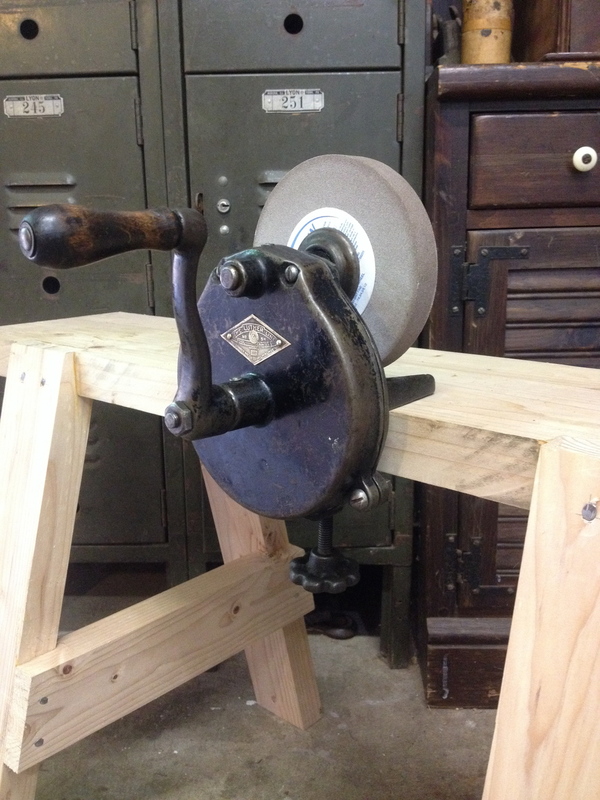 Here is a crash course in restoring old tools using vinegar. There are many methods, many of which I've tried, but this is the one I used most. I try to use as many natural or organic products as possible and leave the heavy chemicals outside the shop because I never know who is going to wander into my shop- kitties, bunnies, chickens and ducks are frequent guests. I tried electrolysis, but it wasn't my favorite because I didn't see much of an improvement on the vinegar process and I had to constantly be worried about one of my critters getting into the electrolysis room and dipping a paw in the water- byebye baby. I got most of my basic tool set in one big lot on ebay and cleaned, sharpened, and rehandled around 150 blades of various kinds within a few weeks. It was a huge task but ended up being totally worth it because I had a TON of practice not only in restoration, but also in grinding and sharpening. I was taught to do both freehand which saved me a TON of time in the long run. If you don't already do this and have some crappier items which you wouldn't mind grinding down a bit, I would highly recommend giving freehand grinding and sharpening a shot. I usually soak and work on small batches of tools at once because it is necessary you clean the metal immediately after removing it from the vinegar. It would be a very good day if I could restore 5 things in one day without getting carpel tunnel, so I try to plan accordingly. What you don't want is to be forced to leave tools in the vinegar too long due to time constraints. If you do end up with too many blades in the vinegar and not enough time to deal with them, take them out, wipe them dry, and then wipe them GENEROUSLY with some citrus wax cleaner to prevent flash rust and then try to get to them within at least 48 hours. If a tool is in particularly horrible shape or will just be a every day user with little lasting value beyond that, I will save myself a few hours and skip the vinegar and go straight to the wire brush on my grinder. This is fast and painless (unless the chisel slips and hits you in the face), but also makes the tool lose value and beauty in about 2 minutes flat. The only way I ever justify doing this is if I wouldn't otherwise restore the tool. I had a gouge sitting in my garbage pile for a few weeks because it was so badly rusted I didn't think it would hold a good edge anymore. One day I was cleaning some welds on my wire wheel and I just grabbed it too. I discovered in the process that it was actually a pretty valuable chisel, but it was already too late. I got a handle on it, sharpened it up, and now it is one of my main carving tools. Having a quick and dirty method to go to saved that chisel's life and now it is being daily used, so there's that. The next two steps involve water and vinegar, both of which have potential to damage wooden handles and other wooden parts of your tool, so remove them if you can. If you can't, try to keep them away from the water and definitely keep them away from the vinegar, or it will oxidize the wood and turn it black. Using dishsoap, water, and a scrubbie (not the metal kind), try to get as much of the loose dirt off as possible. If the piece is especially grimy, an overnight soak might help get some of the gunk off. 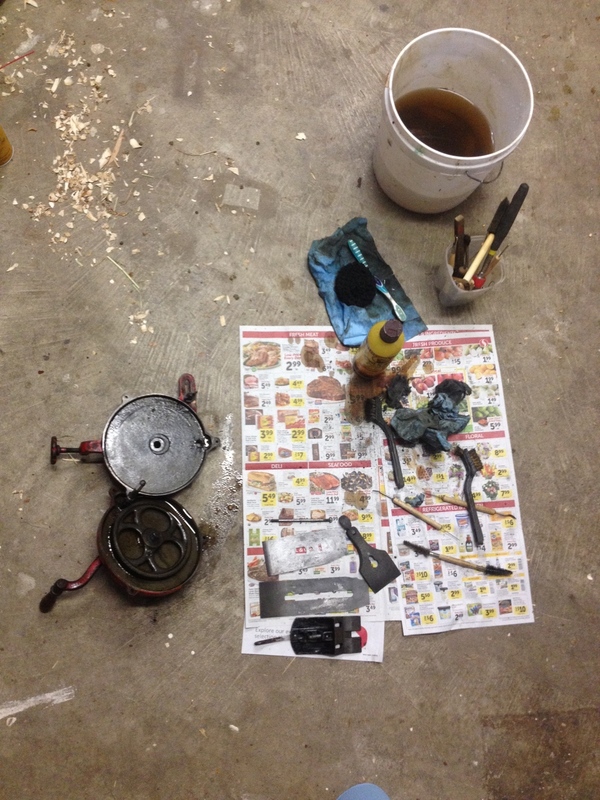 Dry the piece off well and immediately either oil all parts or immerse in vinegar or the metal will begin to rust. Fully immerse the tool in white vinegar- I buy mine in a box containing two gallon jugs for about $4 from Costco and the vinegar can be reused- though because it is so cheap I often toss it after each restore because it gets pretty gross pretty quick. I put all the metal parts in a plastic bin to soak in the vinegar anywhere from a few hours to 48 hours. Do not leave in the vinegar for much longer than that or the vinegar will begin to eat the metal as well. Gloves are not necessary at this stage because the vinegar is basically harmless, but I have pretty sensitive skin, so I try to wear gloves through the whole process. Whenever I find extra small latex free gloves, I buy them in bulk because my size is surprisingly hard to find. Every few hours, take the tools out of the vinegar starting with the thinnest, smallest pieces and examine the progress. A few wipes with a towel will let you know how much of the rust is gone. I have found it is always better to "undercook" rather than "overcook" at this stage because early on I literally dissolved a few sets of calipers I was trying to restore. Not funny at the time, very funny now. When you are satisfied with the work the vinegar has done on your behalf, take the metal parts out, one by one and dry them well with paper towels. Then immediately coat with oil, citrus wax cleaner, or anything that is going to stop them from beginning to "flash rust" which can happen literally within minutes of removing the tool from the vinegar. I usually use mineral oil because it is so cheap. Using a series of nylon brushes, old toothbrushes, Q-tips, paper towels, and a dentist's toolset I got for $12 on Amazon.com, I begin the cleanup process for the metal. I want to be very careful here to remove the dirt, grime, and rust, but nothing more. Especially on handplanes, you want to be very careful here to keep as much of the "japanning" or black paint on the interior of the plane body and frog as possible. Using harsh metal brushes, sandpaper, or hastily using the dentist's tools here can scratch the metal's surface, remove the japanning, and cause you all kinds of headaches later on. On surfaces that don't have japanning, I use 0000 steel wool and brass brushes liberally. People often ask when they are "done" with this part. As with everything, I think you are done when you are happy with the results you have achieved. Some people care way more than others about this part, but in the end, it's your tool, your shop, your time, your effort. The main purpose of this whole process is to remove rust that will endanger the lifetime of your tool. When finished with this step, unless it's a handplane, generously oil the tool, coat with paste wax or Boeshield, and reassemble. You're done. If the wooden components are not damaged or in especially rough shape, I like to leave them how they are. If they need to be sanded, epoxied or reshaped, that's another article. I remove old paint and other grime by carefully rubbing the tool with 0000 steel wool and Hornsby's Citrus Wax Cleaner. A lot of times an overnight soak in oil followed by a coat of paste wax applied with 0000 steel wool will do wonders to brighten them up and make them really pop again. Handplanes need to be dead flat on their bottoms and sides to work properly. Again, there are many ways of doing this, but I start by reassembling the plane and making sure the blade is recessed all the way into the body of the plane, not protruding from the bottom at all. Then I use spray glue and sheets of sandpaper pasted to granite or melamine and begin planing across the sandpaper with the tool as if I were working wood. I like to start with 400 grit sandpaper because if the plane sole is already fairly flat, I won't have to work through the grits again to smooth out the scratches I made by starting with too low a grit. If a lot of metal needs to be removed, I will move down to 150 grit, plane until there is an even scratch pattern along the whole sole of the plane, or very nearly so, and then move up the grits to remove the scratches. I do the same thing on the sides of the plane and then take a few passes on the last grit with the plane tilted slightly to sand off the sharp corner edges I have just created by flattening the three sides of the plane. When done with this, coat all metal parts in paste wax or spray with Boesheild. The next step is to oil up the moving parts of the tool using 3 in 1 or your favorite oil, sharpen the blade, reassemble the tool, and test the plane out. This part also has a few intricacies that would warrant another article- making sure the frog mounts squarely to the plane bed, making sure the chip breaker mates properly with the blade, scootching the frog forward or backward for fine or medium use, etc etc etc, but for the sake of this article, we are going to assume all of that stuff is working great. Also, as I have previously mentioned, sharpening is another article as well, and one I'm not anxious to write because there are so many methods and so many volumes already written about it that you basically need to just do some research, pick a method, learn it, practice it and stick to it. That said though, for your plane or chisel to work, the back of the blade needs to be dead flat, a straight bevel needs to be ground on the front, and the blade needs to be honed and stropped to whatever level you want to take it to. I will share a secret here that, if properly used, will save your hands, your stones, and a lot of time in the flattening process. Do this only if your blade is very pitted or extremely out of true. Mount a belt sander sandpaper belt side up in your bench vise. Practice (when the tool is off) laying the topmost inch or so of your blade dead flat over the paper. Then turn the tool on and be very careful to put even pressure all around and get it as flat as possible here. Next, move to flattening on your coarsest stone (or whatever method you use). Using even pressure on a diamond plate or your stone, rub the blade back and forth until an even scratch pattern can be seen across the entire back of the blade where the bevel meets it at the tip. Move up through the stones until the blade back has a mirror polish. You should be able to see your reflection when you are finished. After a few minutes at each stage of this process, color the whole back of the chisel where you are working with black sharpie. Rub a few strokes on the stone and see what of the chisel markings is being removed. Adjust your strokes and pressure accordingly until a few strokes on each stone will remove the sharpie marks entirely, especially at the edge near the tip. If you are afraid of using the belt sander but the blade has very obvious high spots, you can also use a dremel tool with a sandpaper or grinder attachment to grind away those specific high spots. Be careful, however, not to get too excited with the dremel and dish the back, or you will have to take even more material off to achieve a flat back. After a few seconds with the dremel, use the marker and take a few strokes on the stone/diamond plate to check your progress. Again, practicing first using a more disposable blade and a sharpie will be helpful because it is, at first, a little difficult to remove material evenly. Practice makes perfect. Or in my case- close enough for woodwork. After sharpening, wipe dry with a paper towel then give the blade a wipe with a tack cloth soaked in jojoba or mineral oil. Jojoba oil is better in my opinion than mineral oil because it is dryer and there is less oily residue left on the wood. Another benefit of the jojoba oil is that it seems to be less "sticky" than mineral oil when it comes to sawdust, and, as I'm sure you know, sawdust is every woodworker's enemy because it traps water and rusts your tool. Once the tool is restored, I coat the entire thing (wood and all) with a light coat of citrus paste wax, (car) Turtle wax, or my new favorite, Boeshield. After each use, I blow the entire tool off with my air gun (be careful not to drop it on the concrete and shatter one of your favorite new planes while doing this...) and then give them a thorough wipe with the jojoba cloth. Blades that have the screw-on chip breaker need to be checked on occasion to be sure there are no shavings trapped in between the blade and the breaker, because those little buggers are sure to rust your blades in a flash. As far as your power tools go, I'd keep all the cast iron waxed up with paste wax or Boesheild. About once a year I go in with some steel wool to get any rust that's forming and then give it a new coat of wax. Sometimes my cats come in from the rain and lay on the table saw, so I've had to use 220 sandpaper to get a couple of the worse rust spots out, but as long as they get re-waxed right away they are good to go for a long time. 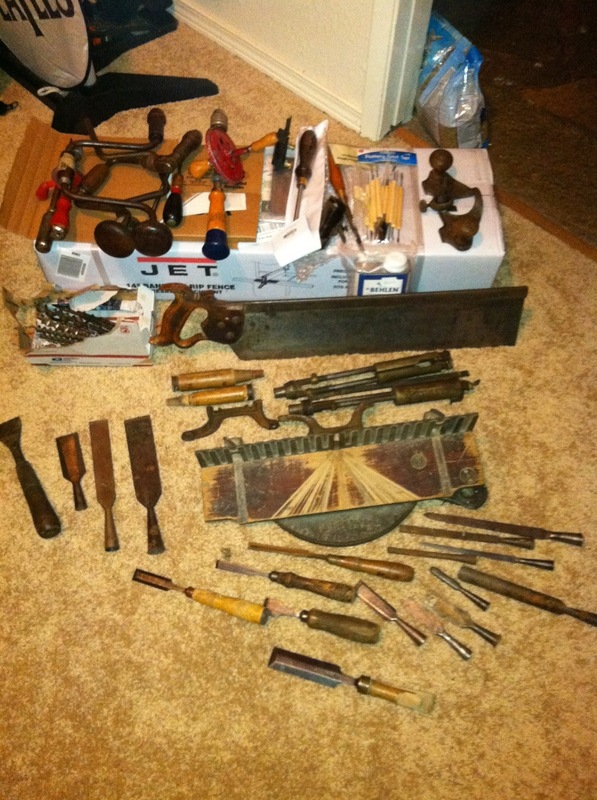 Posted on July 1, 2014 by Anne Briggs and filed under How-To, DIY and Home Renovation and tagged Tool Restoration.